hmmm....i must disagree man....the gimp is pretty good. Adobe is better, but whats better for a home user? paint or the gimp? openoffice or microsoft office? The gimp comes out tops for all the free art programs. for example, i cant see Paint doing this http://www.gimp.org/...nt_Brush/19.png . As for my origonal post, i have no bias to windows or linux. Edited by comanighttrain, 20 August 2005 - 09:27 AM. I have a lot of respect for UNIX on servers. I've talked about Linux Desktop OS's so many times during school, on forums, etc., and the only real facts they give me is that Linux defaults to give you LIMITED user privileges, but Windows gives you ADMINISTRATOR. My questions...if you are tech savvy, why would you be afraid to run LINUX as admin? If that's the only security feature that is being proclaimed by LINUX, why not use Windows and change your privilege to LIMITED to protect yourself? I've been using Windows since 3.1, and that was an upgrade from DOSSHELL, which took DOS commands to get to and to get around...old Packard Bell with Prodigy as the ISP...anyone remember PRODIGY . I've never had a security problem on any of my machines...I have always ran as an administrator, but of course I've set up accounts on my computer for others, but they were limited. If I ran into a small problem, I would research and eliminate...usually that occured because someone jumped on my computer without me logging off first, and surfing through the net or downloading things that they shouldn't have been doing on my account, andwouldn't have been able to at their user status. Are you saying that if a user runs as an ADMINISTRATOR on LINUX, that they are just as vulnerable as if they were running Windows as an administrator?? Thats not strictly true, there are far less linux compatible(that just doesnt sound right) viruses, but there are plenty of them, ofcouse this means nothing, if you goto dodgy sites, or download dodgy stuff, you get viruses, fact of life really. Look everyone knows that there is no perfect OS. Every OS has it's own Pluses and Minuses. For me, Windows just doesn't fit the bill. Nor does OSX. I have however tried NetBSD recently, and like it more than SuSE. See, even a diehard fan of an OS can change his likes for simply trying. ;-) Anyways, this thread is getting out of controll. I stated my point, and will be here no farther. I was completly honest about what I said. Quickly though, I have Adobe, but actaually prefer the GIMP over it. Photoshop shop just doesn't do it for me. However, again it's all opinions. It's a charming tolerable attempt at one at best. I doubt you'll find it used very often in the graphic media sector. Photoshop runs great under Wine. And for the price tag (free as opposed to $700) Gimp offers a LOT of features that Photoshop does (I absolutely LOVE Photoshop BTW) and all it really requires is a bit of a learning curve. 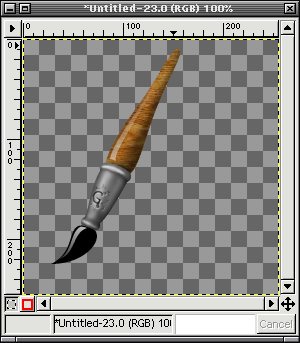 Sure, professionals will use Photoshop, but for the average home person who cannot afford to shell out $700 for a piece of software, the Gimp is a very admirable alternative. You are correct...don't get upset or offended, or amped up about this. NOthing has gotten out of hand...just a bunch of people sharing insights, OPINIONS, experience, and etc., on this topic. On the other note, for the other poster. Thanks for the reply about the vulnerability. That has been the most honest and blunt answer I've ever gotten. It is true that there aren't any attacking agents made for Linux...FOR NOW. Get a bittorrent client, tap in "Photoshop" and roll. Just as free as Gimp. Learning curves don't interest me, it's the eternal excuse for all that stuff. Productivity is the king. Money needs to be made (if you're not a hippie). For the user who wants to draw and doesn't want to download an illegal version of Photoshop I'm sure there are 'free' applications under Windows aswel. No reason to switch to Linux (Imagine you want to print your artwork and have to configure CUPS). Wine is the Linux community admitting defeat. Wine is saying that the real guys don't trust the viability of this linux-hype yet, so you need something that makes windows-stuff believe it's running on windows. That doesn't suddenly make it a Linux-application. It doesn't prove Linux is good. It only tells Windows has the good applications/developers/software houses and Linux needs to imitate it. If it runs under Wine, it doesn't run on linux. You can't use it as ammo for your cause. Otherwise I'll say that I can run Linux on VMWare, which I have running on Win2000, which makes Linux a windows application, ending the entire problem. Wine is what clochards use to not see the truth. Im not going to argue. Your last couple of statements have highlighted you inability to make a good arguement. Linux can do everything windows can do in terms of productivity, but it can do it free of charge. Linux means anyone with a computer can be productive, Windows doesnt have this, there is no free windows. I personally believe everyone is entitled to a decent operating system for free....Linux fills in nicely, but so nicely, that it does compete with windows quite well. You apparently don't cost anything per hour. Fiddling with linux to get it to work costs time. Time for people who work, is money. So Linux is not free. It's free to download, it's not free to run. And since a lot of things on linux take more time than the same thing on windows, linux in the long run gets more expensive than Windows (where you're done with the registration/purchase costs). That Linux can do everything Windows can do is not true, and you know it (drivers forinstance). So that argument is voided. Anyone with a computer, a lot of time and an inclination to learn something that you wouldn't have to learn when you have Windows, where you can immediately go on to doing what you want to do instead of doing what you have to do first in order to be able to do what you want to do. Again, there is no free Linux. There indeed is no free Windows, but there is no free Hardware either, so if you're going to fork up the cash to buy the hardware, save a few pennies for your OS. The real cheapos should just save their money and not get a computer. That's a nice belief. But beliefs make no arguments. When you buy a CD-player, do you also 'believe' music should be free? And how nicely linux fills in is also a belief. According to Adobe(for example) it's obviously not a match yet. slackware is free! as is Ldios! and it is free to run. What are you talking about? A majority of Linux software its free for use. You really are full of it. Whats this about the cd player and getting the music free? thats different all togther. Dont try and give me your industry crap, I am a Student of computer science. I know that in between the music and the CD, is a bit of software that makes the cd player work, should you have to pay for that? No, music, yes because music is the media that the Cd player uses. Now consider a computer system, you have the hardware (cd player equivelance), the OS(the cd player bios equiv) and the software (Music). I believe the OS, or atleast decent one, should be freely available. charging for the software, such as adobe, is fine. I appreciate that a heck lot of work goes into OS programming, but the least microsoft could do is release an older edition of their OS for free (98, 2k). Why? so that if someone with a severe budget can afford to use a computer system. Did you know the third world are using linux in schools? because its free and reliable and applicable. Your arguements are rubbish, and your comment about downloading adobe from bit torrent was reckless, i can guess your the one who wants free music with your cd player. I dont want to argue about this anymore, your previous arguements have been quashed by not only me but others and i didnt post on here to argue with you. Edited by comanighttrain, 20 August 2005 - 12:28 PM. Windows is a user friendly OS, linux is more secure, and complex. IMO you have to balance between simplicity and security. Too simple and you get windows, where new sploits come out every day. Too secure and complex, and you get something that the average user doesn't want to deal with (slackware for example). But if you've never used linux, and I mean lived on it (Not tried it out for a day), then don't bad rap it, period. If you need a simple distro, FC3 is about as easy as windows xp. Don't tell me you have to spend hours "fiddling" with it. If you know what you're doing, it takes no time at all. Anyways, it all comes down to preference, support the evil empire, or support the rebels. Get the best of both worlds, dual boot win xp and suse 9.3 pro. somethings you just cant do in Linux, and vice versa. Edited by todd333, 01 September 2005 - 03:40 PM.